Watch the alphabet come to life as children run and twirl and jump and play their way through the ABC’s with energy! This imaginative rhyming alphabet book teaches young learners not only how to move from A to Z but also how to creatively have fun as they stay active and keep their bodies healthy and strong. The book includes a special section for parents and caregivers with tips for using movement to teach social-emotional skills. ​some sheep. But how can she count them when one of the sheep can’t jump over the fence? Join Sam and her flock in this frolicking, rhyming farmyard tale as they try to help little Shep find a way over the fence. I scream, you scream, we all scream for I CAMPAIGNED FOR ICE CREAM! When nine-year-old Josh discovers that ice cream trucks are illegal in his town, he could scream for ice cream—instead he campaigns. In this true story, Josh learns about leadership, perseverance, and civic action as he takes on Town Hall and fights to repeal their ban on ice cream trucks. 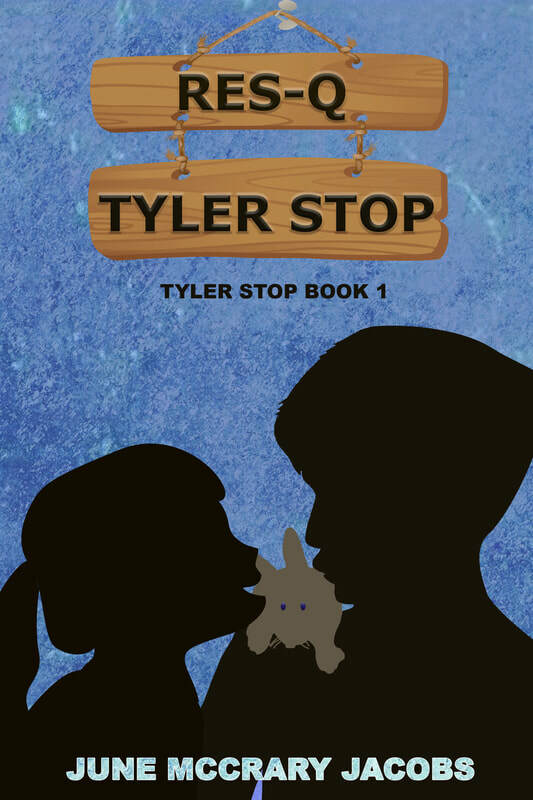 'RES-Q Tyler Stop'is set in the small, rural, fictional town of Tyler Stop in Sonoma County, California, in the summer of 1968. The protagonist, eleven year-old Weston Gregg, is a bright, inquisitive young man who faces several challenges—racial prejudice targeting some of his friends, a serious injury caused by his own impulsive decision, and the on-going trauma of dealing with a same-gender bully at his school during the four-month period of the story. Our narrator thinks something strange is going on at the llama farm. She’s sure the llamas are talking to her! A talking herd of llamas – can that be? A charming and humorous rhyming story about a quirky bunch of llamas just trying to be heard. The perfect beginning reader book, designed to entertain and enchant children while supporting them to learn to read through clever use of rhyme and repetition. If you and your child enjoy Dr Seuss, Mo Willems or Aaron Blabey books, you’re going to love this fun story. ​Can an Israelite captive, wrenched from all she loves, serve the very man who destroyed her village? Neil Alden Armstrong was the first man to set foot on the moon on July 20, 1969. Most people know that story, but very few know how Neil’s teen-age dream to build a wind tunnel helped him walk into history. In this unique pup story, Lottie makes an unusual discovery while beachcombing one day. She then spends her day wondering, Who will care for this little lost pup? and asking, “Will you care for this little lost pup?” But she finds that it will take a special person to care for this very special pup. Who Will? Will You? keeps readers guessing exactly what kind of pup Lottie has found, as they learn about different pups along the way. Includes fun animal facts for a pup-tastic good time! Join Ava’s team as she becomes a citizen scientist for a day on her town’s Christmas Bird Count. Ava is excited when Big Al, the team’s leader, asks her to record the tally this year. Using her most important tools—her eyes and ears—she identifies and counts the birds they observe on a route through diverse habitats. What’s a service dog to do without a family to serve? When an unexpected guest wreaks havoc at Pupperdine Academy graduation, Boomer sets off on a journey to find a family of his own. A few misunderstandings leave him feeling hopeless until a furry feline changes his fate forever. Boomer finds his special family and his special purpose…but it’s not what you think. “Let’s walk together to show our support for safe schools,” Maddie grabbed her best friend Stella’s hand. Based-on a true story, WALKOUT tells about democracy in action as Maddie organizes an anti-school-violence walkout to join other kids throughout the States, despite the principal’s announcement that their school would not be participating. The problem is, her best friend Stella is too scared to join in. How can Maddie convince Stella to find her courage and join in? Life isn’t a piece of cake, but we get by. Ellie Cowan isn’t a bad kid. It’s just that anybody sees a girl in a wheelchair, they think she’s going to be sunshine and cuddles. Well, excuse her for having an opinion. ROLL WITH IT is a middle grade novel that follows twelve-year-old Ellie, who dreams of being a famous chef instead of just “the kid with cerebral palsy,” as she tries to find her place after moving to small-town Oklahoma when her grandfather’s Alzheimer’s takes a turn for the worse. Twelve-year-old Alex was taught illusion by the best. 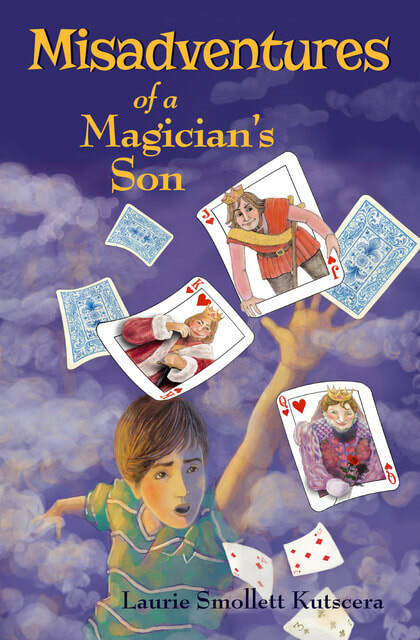 Misadventures of a Magician’s Son tells the story of Alexander Finn’s personal journey dealing with the death of his father, a celebrated magician, and the extraordinary gift he left behind. Uprooted from his childhood home for the seemingly hokey town of Orchard, Maine, Alex refuses to unpack and wants nothing to do with his new surroundings. But when he discovers an unusual deck of animated cards tucked in the back of his father’s old desk, things begin to unravel and Alex’s true adventure begins. A middle grade book for ages 8-12. Stomach in knots like a triple-tied shoelace? Check! Sunday is scared to face her first surgery to repair a hole in her eardrum. She squashes her topsy-turvy nerves with the help of her parents, a stuffed octopus, and the hospital staff. In the end, Sunday learns that she held the secret power to overcoming her anxiety all along. Little Medusa comes from a long line of snake-loving, serpentine-wearing Gorgons. When Little Medusa receives her first snake, she discovers that having a snake slither and slide through her hair isn’t so great after all. And worse, she begins questioning if she really wants to scare her friends to stone with her new forever friend. Using her imagination and heart, Little Medusa tries her best to please her family, her best-pet snake, and herself. 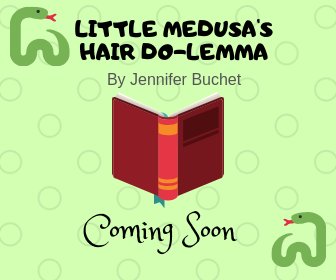 ​Based on Greek Mythology, Little Medusa features Common Core connections and explores the universal themes of following family tradition and staying true to oneself. Drought-stricken Zimbabwe is too hot for little rhino Obi. On the hunt for a cool mud bath, he gets his snout stuck in one mess after another. Finally, Obi realizes it will take some dance moves and a little help from his new friends, an ostrich, giraffe and elephant, to find the best way to beat the heat. ​Based on an actual event, Obi’s story has STEM connections and will be giving back to communities affected by water issues.